No, we don’t have a time machine, but you might think we do once you step back into Tokyo’s past! On this private Tokyo tour, you’ll explore hidden shops that sell traditional items not commonly found in modern-day Japan. With your own local guide to show you around on this private experience, you'll sample old-world sweet and savoury snacks, learn about the art of incense, visit a seaweed seller, and see a side of the city frozen in time, far from the bright lights of downtown. 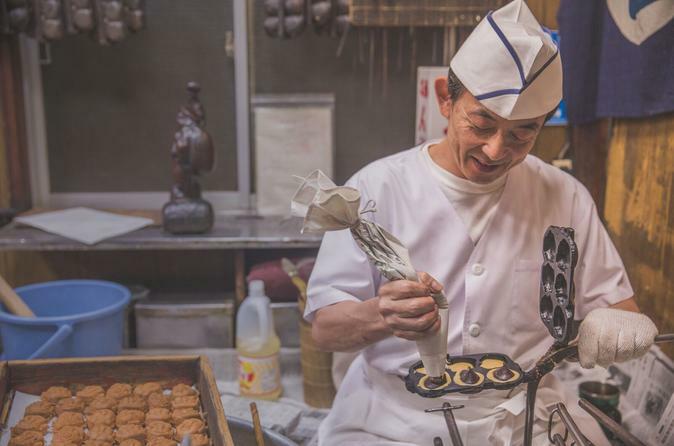 We’ll start your private Tokyo tour in the neighbourhood of Ningyocho, a district known for its old traditions and, as you’ll discover right away, tasty treats. That’s because the smell of cinnamon will lead us to our first stop, a shop that specialises in Japanese sweets. Established in the Meiji Era (1897). Next up, we’ll stop at an incense store that dates back to 1705, where we’ll learn about Kōdō, the art of appreciating incense and the traditional Japanese incense ceremony. Along the way, we’ll also visit a little gift shop that carries various traditional Japanese items, from calligraphy tools to decorative wares. Hungry? Good! We’ll stop at a snack shop from the Showa Era that carries treats popular in the early 20th century, including candies, caramels, Ramune soda, fish jerky, and bean paste snacks, to name a few. Then, we’ll visit two shops specialising in a specific traditional snack: senbei, or rice crackers. We’ll try sweet kawara senbei (made from flour, not actually rice), as well as salty rice crackers, a favourite in many Japanese households. We’ll then cross the street to a shamisen shop, and learn a bit about this traditional Japanese musical string instrument. From there, we’ll head to a local tenugui shop, where they sell woven hand towels depicting Japanese scenes. Your private Tokyo tour will next lead you to one of the eight temples in Ningyocho. We’ll visit a shrine where virtue, longevity, learning, and wealth are worshipped. You can offer a prayer here, and wash a coin to ensure a prosperous life. Once we’ve exhausted Ningyocho, we’ll visit another nearby neighbourhood, Nihonbashi. The district of Nihonbashi was a hub for merchants during the Edo period. Today, it is predominantly a financial district that houses trading firms, and even the Tokyo Stock Exchange. And although Nihonbashi is very much a modern neighbourhood, it features many traditional Japanese shops hidden in its alleyways and even within its department stores. We’ll visit a seaweed shop, as well as an old-fashioned stationery shop that was established in 1946. You’ll get to browse through the display of calligraphy brushes, inks, traditional paints, handmade greeting cards, and little dolls. We’ll also check out a toothpick shop (yes, toothpicks) that has been in business since 1704 and that gives something extra special to buyers — each toothpick is wrapped in a piece of paper with a poem, and is produced by hand. We’ll also stop at a katsuobushi shop that can be traced back more than 200 years. Katsuobushi is the fish shavings used to make fish broth, the very essence of Japanese cooking. Lastly, we’ll check out the shop that makes golden leaves measuring 0.0001 mm, and that have been traditionally used for decorating ceramics, furnishings, and even food.